Prompt your group to tell a creative story. Our conversation ball features fun story starters. Spark conversations and encourage personal stories. Players simply continue where the story starter left off. A great idea is the key ingredient to any creative story, which we've taken care of for you! This newest addition to our Toss 'n Talk-About® collection features colorful illustrations and lots of fun and imaginative story starters to get the creative juices flowing, like "The heavy brown package had no return address, but I know it was…" and "She really didn’t want to go in there, especially since…" Spark conversations and encourage residents to tell their own stories. Players simply catch the 24" ball and continue where the story starter left off. Great for all ages. 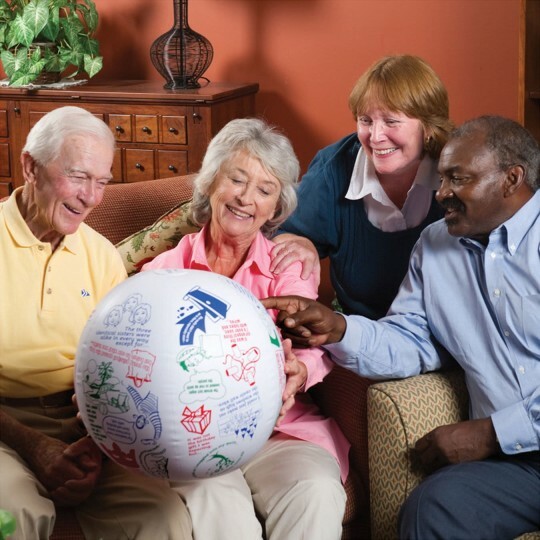 The residents at our care facility have enjoyed getting together and tossing this ball to one another and hearing the responses to which starter has been touched. This product ehance the imagination. I use this product at my facility and it's great for residents with dementia. It help to simulate their imagination besides being an easy tool for hand/eye coordination. A great new way to get everyone talking and laughing! The story starter lines are great for any age group and are sure to get the creative juices flowing. The illustrations are really fun too and the ball is thicker than most inflatables so it's sure to last for years!